Let’s keep things simple: 5 bands, 5000LL! 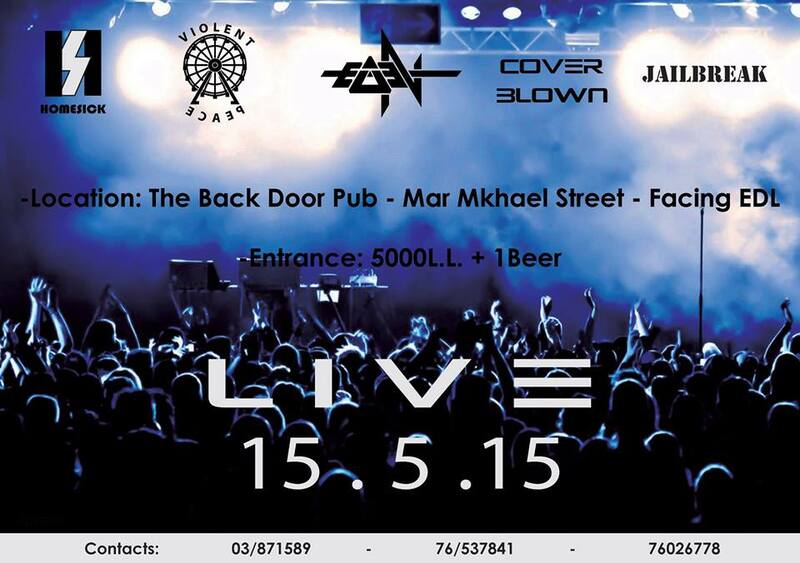 Join these bands (listed below) on May 15 for a variety of rock, blues, and some metal, along with an acoustic set at the Back Door, Gemmayze. These bands previously promised you a show, NOW YOU GOT IT. Familiar with the band Decibel Hunter? Well then, you will love this band, because it’s an acoustic duo of Decibel Hunter members featuring Hrag and George. Decibel Hunter is a local band composed of regular teens but with an extreme love and passion for music. Their journey has just begun but their promise and goal is that throughout the whole journey, a new and extraordinary side of alternative rock music will be created and revealed to daze even the most musically inclined person. After multiple lineup changes and warmup shows, Homesick finally cemented their lineup with bassist Charbel Awad joining the band in the summer of 2014. Ever since, Homesick have gradually progressed with multiple shows and festivals under their belt, most notably winning Virgin Radio’s Battle of The Bands 2014 by Judges’ Choice with their self-titled single “Homesick”, paving the way for them. With influences ranging from 70’s hard rock/blues to modern alternative rock, they are constantly developing musically without going too far from the basic roots of Rock N’ Roll. After getting major feedback concerning their energetic live shows and musical foundation, they have decided to work on their debut. Violent Peace is a four-member rock band covering songs of their influences. They also have their original songs. Cover Blown is a band that will bring up the roots of rock and roll, and spread it among the town. The band started in early 2015, consisting of 4 members. Music has become a part of their lives, and the band is where they express their thoughts and feelings through music.